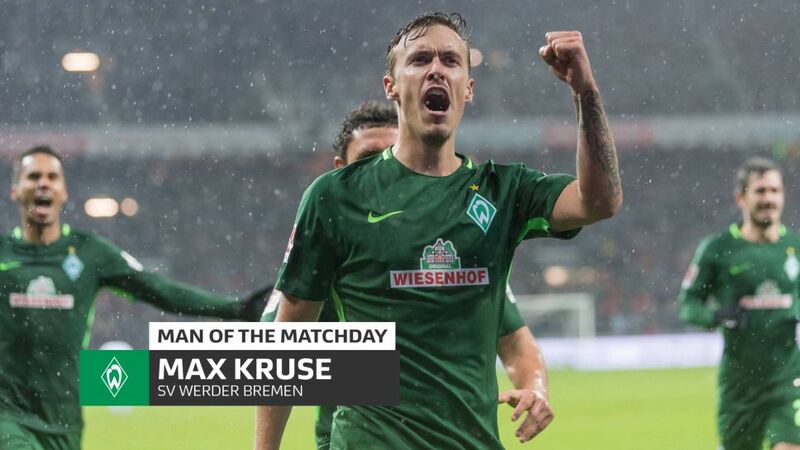 Max Kruse put in a match-winning display for Werder Bremen on Sunday, scoring three and providing an assist in the 4-0 win over Hannover. Werder Bremen striker Max Kruse had the Green-Whites fans singing in the rain on Sunday with a hat-trick and an assist in their 4-0 win over Hannover – the club’s first Bundesliga victory of the season. It was a performance that earned Kruse the honour of Matchday 12’s Man of the Matchday. Following a 15-goal campaign last season, Kruse had failed to find the back of the net at all in the league so far in 2017/18 before the floodgates opened on the River Weser with three goals in 23 second-half minutes. It was the Germany international’s third hat-trick in the Bundesliga after trebles against Ingolstadt in April 2017 (he went on to score four that day) and for Wolfsburg against Hoffenheim in October 2015. Kruse got the ball rolling in Bremen as he slipped a sumptuous through-ball to Fin Bartels, whose chip over goalkeeper Michael Esser was just as sublime. The second half, however, turned into the Max Kruse show. Bartels returned the favour for Kruse to double the lead early after the break, and only four minutes later he had his second and Werder’s third of the game with a calm finish past Esser. The rout was complete with a little over ten minutes to go as Bartels, again, set up the 29-year-old to round off his hat-trick before heading off to a standing ovation from the rapturous Weser Stadium crowd. The 4-0 win, which lifts Bremen up to 16th and out of the Bundesliga’s automatic relegation places, comes in Florian Kohfeldt’s second game in charge of the club following the dismissal of Alexander Nouri at the end of October. The 35-year-old had been confirmed as Werder’s boss until at least the winter break following a spirited performance in the defeat to Eintracht Frankfurt on Matchday 11.